The sky was placid – that color between dark blue and yellow minutes before the first light of dawn on January 27, 1951. 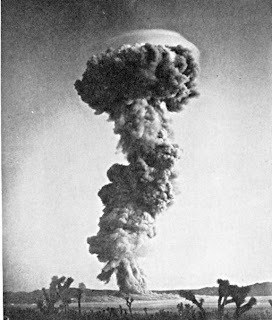 Moments later, an Air Force B-50 bomber banked left over the juniper and Joshua trees, dropping an atomic bomb on the desert west of Las Vegas. The sky shattered with a flash of light that awakened ranchers as far away as northern Utah. The concussion shattered windows in Arizona. Radiation swept across America, contaminating the soils of Iowa and Indiana, the coastal bays of New England and the snows of northern New York. Thus began the most prodigious program of scientific experimentation in United States history. Our skies were changed, and so were the lives of families living in the hills and valleys of southern Nevada. Over the next twelve years, the U.S. government detonated 126 bombs into our environment. The tests were announced so my folks knew when they were coming. We three children waited in the dark mornings for the rattle of windows, praying they wouldn’t break. We were not allowed near them on those days. I didn’t really know what was happening, but I was scared as I kneeled behind my chair. Duck and cover, what were authorities thinking? Our ranch lay under the flight path of those pink clouds, containing radiation levels comparable to Chernobyl in 1986. (America Ground Zero, the secret nuclear war, by Carole Gallagher). Each week, my family received a regular dose. We were at America Ground Zero in a secret nuclear war. 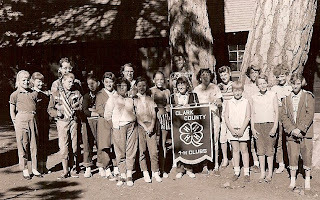 We children were not allowed to play outside, though the only admonition from the government to children in Utah where there was such a human toll, was, “Don’t eat the snow.” Snow pealed the paint off cars. The snow in southern Nevada was gray ash, falling on our fields. No one who handled the soil or hay or drank milk from cows that ate the hay or ate from any crop around our country avoided exposure. We children didn’t play outside on test days, but my parents went about their daily routines. My dad and grandfather worked in the fields, wearing radiation badges. When government men came to check badges, they had changed color. The government men walked away shaking their heads, but no one told us what it meant. Mama did her chores around the house and yards, worked with the horses and calves. I wonder which cloud had such an impact on her life – the one that molded mine. 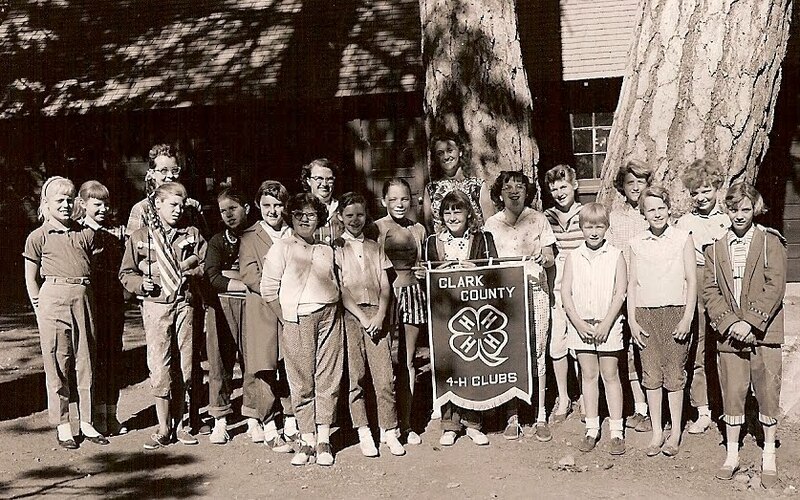 Mama was Overton’s 4-H leader and I had looked forward to a week in the mountains with her at 4-H camp, but she had been in bed ill for a couple days. I rushed into the cabin and knelt beside Mother’s cot. She lay very still. "Are you feeling better?" I whispered, hopefully. I think I woke her. I wanted to show her the sculpture I made in craft class. She told me she didn't feel better, but I should go have fun that was what 4-H camp was all about. As I left the cabin, my shoulders were weighed down with disappointment – having fun was a tall order I wasn’t quite able to fulfill. I wasn’t used to seeing Mama so still. I thought maybe she would feel better the next day, and we would have a chance to play. But tomorrow didn't come. When the week-long camp ended, Mom was still sick. We rode home quietly on the bus. I didn’t feel like singing 100 Bottles of Beer on the Wall. We didn't know it would be three more years before we found out what was wrong. A couple days before my thirteenth birthday, a rash developed on Mother’s face. She had visited a Dr. Larouso several times, but that day he recognized the wolf mask of Lupus. When she came home, she said, "The Doctor has ordered me to the hospital." I felt confused. I didn't know what it meant for her to go to the hospital. My only experience with the hospital was when I had my tonsils removed. I suddenly felt terrified, remembering Mama’s silhouette in the hallway as they wheeled me down the hall to the surgery, screaming. My heart began to pound. I naively asked if she would be back for my birthday. She said, "I don't think so, Hon." She left so quickly and Grams went with her. I wondered who was going to bake my birthday cake. Mama made every day wonderful, but birthdays and holidays were especially exciting. She baked a different cake for every season and event and reason. Mother was told she had arthritis in her eyes. She had been told a lot of things. Our family doctor said there couldn't possibly be as many things wrong with her as she described. I feel the sting of injustice even now, when Mother has been gone twenty years, and bristle at what she must have felt hearing that, knowing things were not right in her body. When Mama was released from the hospital after being there a month, I sat very close to her in the backseat of the car, holding her hand. I was relieved. She was coming home. I never wanted to let her out of my sight again. I thought life would go back to normal: swimming, skate club, basketball, and bike riding, but soon after she arrived home, her body tried to pass kidney stones. Members of my family took turns walking her around the yard. I walked beside her too, her arms around me. I was worried. Then she was gone again, this time for another month to the Hospital in Salt Lake City. When Mama left, again, Grams went with her. My guardian became none other than that enigmatic woman, Aunt Laura. I hated the dark bedroom I shared with her in the basement of her sister Della Whitmore’s home. The dark only magnified my oppression. If I could have stayed in one of the sunny, upstairs rooms, I probably would have liked it in the country. My mother was gone, I didn't know for how long, or if she would ever come back. During the summer of 1961, a war raged in Asia. I always walked through Aunt Della's living room with my hands over my ears. The older people always watched the news, and the news was always bad. I could not bear one more frightening thing at thirteen. After our trip to the Vermiculite (Described in "An Independent Woman"), Aunt Laura didn’t take me back to Aunt Della’s, we stayed at my home. Every day, I wrote a letter to Grams, begging her to let me come to Salt Lake. Every day, Aunt Laura left fifteen cents on the kitchen table, the cost of going to the swimming pool all day. One night, as I lay on a cot in the front yard, I looked up at the stars and said a prayer. I don’t remember the words. I felt so small in the universe. How could I do anything? But I heard an answer in my mind, “I love you. I have a work for you to do.” The skies had changed. No more were they only a place from which terror dropped onto innocent children, making their mother’s sick, but a place where messages came from God.